UPDATE: The Washington State Patrol (WSP) says that the driver of the box truck involved in the fatal crash with a school bus in Orondo Thursday morning had fallen asleep behind the wheel and crossed the centerline. According to Trooper Darren Wright, the box truck was traveling northbound on Highway 97 when the driver fell asleep and crossed the centerline, crashing into a Pontiac GrandAm and then a school bus transporting 43 students. Wright said 22-year-old Carmela Morales, who was driving the Pontiac, was killed in the crash. The bus driver, 53-year-old Pamela Robertson, was injured, as well as the driver and passenger of the box truck. ORIGINAL STORY: Washington State Patrol (WSP) officials say that the driver of a car involved in a crash with a school bus and semi truck on Highway 97 near Orondo Thursday morning was killed in the collision. 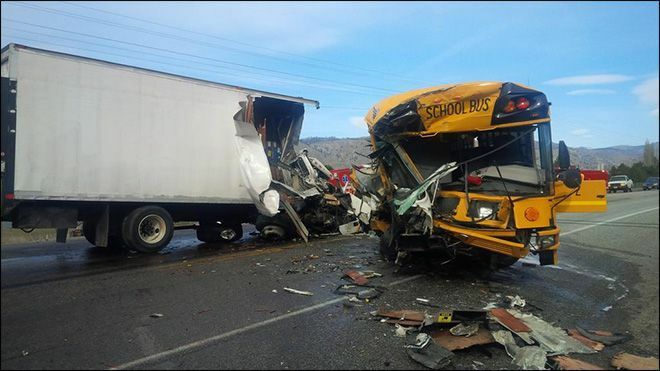 According to WSP Trooper Darren Wright, troopers responded to the scene at approximately 8:30 a.m. after receiving calls of a crash involving a school bus, box truck, and passenger car. Troopers told KOMO News that the bus was transporting 43 students of varying ages to Orondo Elementary and Middle School when the crash occurred. All of the children were taken to a nearby hospital to be evaluated for possible injuries, and Wright says at least five of the students are believed to have suffered minor injuries. A spokesperson with the Orondo School District says that all students were being taken to Central Washington Hospital regardless of injuries, and that parents should pick their children up at the hospital. According to the Wenatchee Police Department, three unidentified people suffered serious injuries in the crash. Troopers did not elaborate on any possible factors that may have contributed to the crash. According to Douglas County Sheriff Harvey Gjesdal, the roadway was clear and dry when the collision occurred. Davis Law Group was founded in 1994 and has represented victims of serious crashes across the state of Washington ever since. Our attorneys have the experience and knowledge necessary to properly investigate and resolve car accident claims that result in serious injuries and fatalities.